I often buy rice mixes. My kids love them and I love the ease of preparation involved. Therefore, you can imagine my excitement when I found some recipes which I can make from scratch and save myself time and money! Combine all ingredients and stir until evenly distributed. Place in airtight container(s). Store in cool, dry place. Use within 6-8 months. Yield: 4 cups. 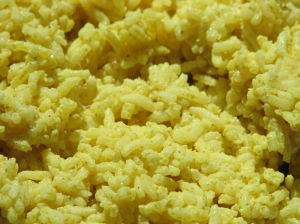 Use 1 1/3 c rice mix, 2 c cold water and 1 T butter or margarine. Combine all ingredients in medium saucepan. Bring to a boil over high heat. Cover, reduce heat and cook 15 minutes, until liquid is absorbed. Yield: 4-6 servings.